Recently, we got the opportunity to travel to Carlsbad, CA to visit Callaway Golf HQ. 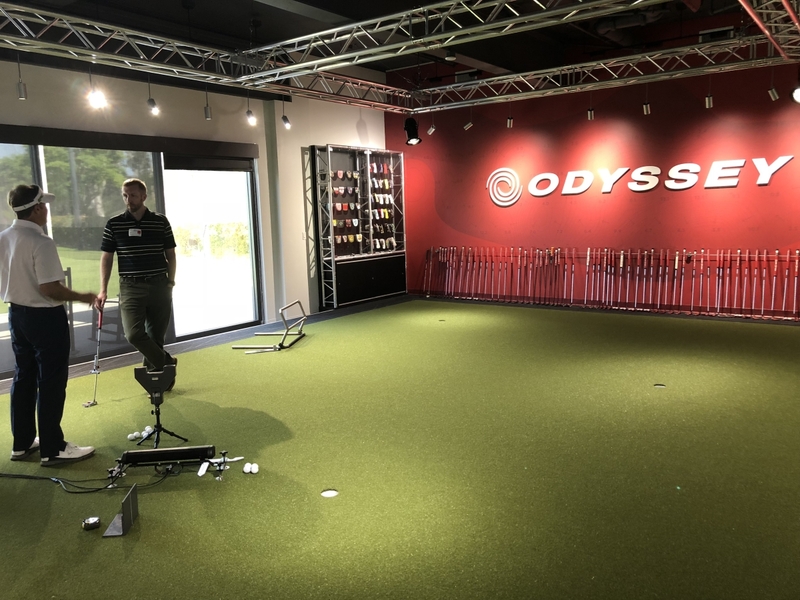 Our tour took us to the Ely Callaway Performance Center (ECPC), where we got to experience the brand new Odyssey putter fitting studio and go through the fitting process. We’ll take you through our time spent with Nick Arther, Senior Club Performance Specialist at Callaway Golf, and what we learned along the way. There are several factors that go into what makes the ideal putter for a golfer. Head shape, hosel shape, length, and lie are just some of these factors. A proper putter fitting addresses all of these to determine the best putter for your game. Before we get into the details of the fitting, lets set the scene for you. 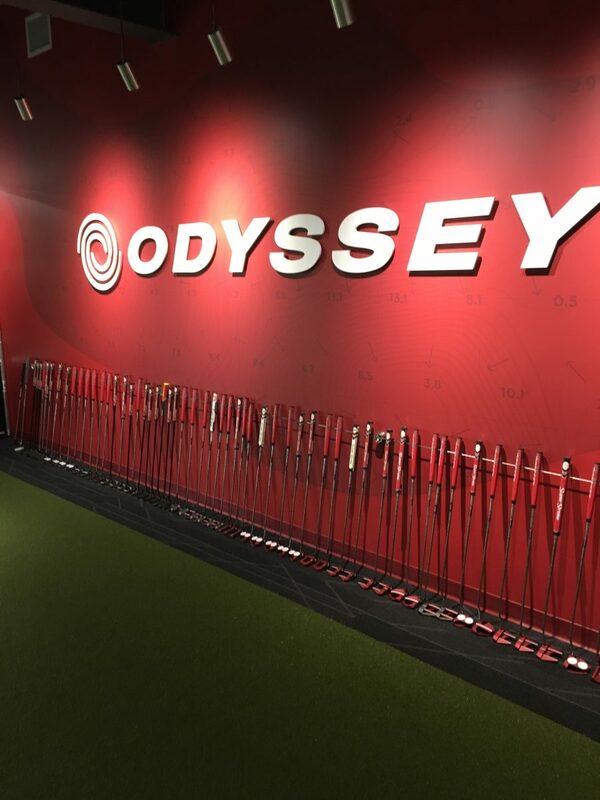 Walking into the newly renovated Odyssey fitting studio, sensors and screens adorn the huge putting green. Putters of all shapes, sizes, and lengths line the walls; Odyssey to the right, Tulon to the left. He then asked what head shape we liked looking at as we walked the wall, taking in the various model options. Liking the head shape is a subtle, but crucial aspect of a fitting. If a player doesn’t like what they look down at, they lose confidence. 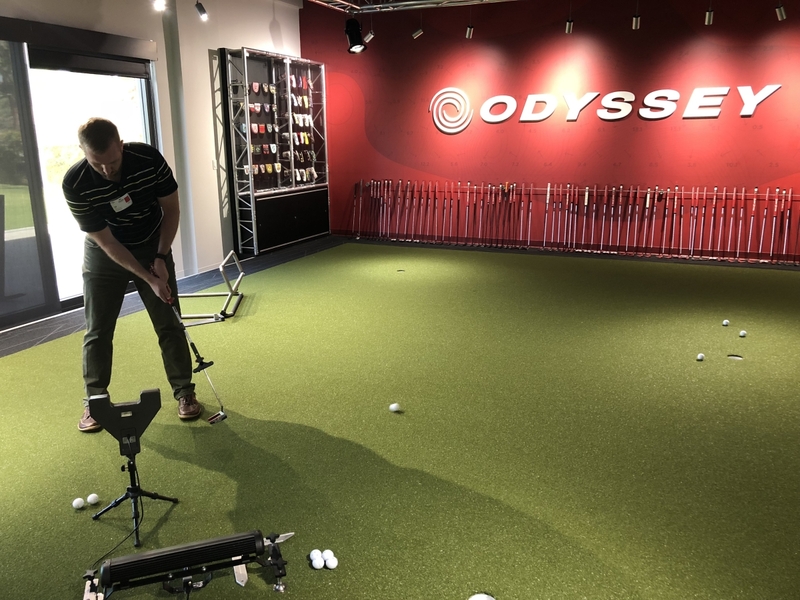 We picked a few Odyssey and Tulon Design putters and Nick had us roll some 15-foot putts, mostly for feel. Odyssey’s Mircrohinge Insert has a distinct difference in feel at impact versus the diamond-milled Tulon Design putter face. During this time, Nick was also eyeing our putting stroke, seeing if the hosel shape was the right fit. As you probably know, a face-balanced putter is ideal for a straight-back-straight-through stroke. A putter with toe hang fits a putter with an arcing stroke (more toe hang is better for stronger arc). After some trial and error, we narrowed down the right head and hosel shape. Now, it was time to get some technology involved. SAM Puttlab, Quintic, and TrackMan are different data-gathering systems used in fitting. However, all use vastly different ways to collect putting data. Trackman is widely known for full shot data collected via its radar system. For putting, TrackMan detects things like club speed, swing time, tempo, launch direction, ball speed, and much more. Quintic uses a series of cameras to track the roll of the ball. It takes several pictures at impact, showing how quickly the ball rolls end over end, impact position, and more. Unfortunately, due to the newness of the fitting studio, the Trackman and Quintic systems weren’t set up yet. So, we focused the fitting on using the SAM Puttlab for the fitting. SAM (Science and Motion) Puttlab uses 2 sensors to gather putting stats using ultrasound, one on the ground and one on the putter shaft. After calibrating the sensor, we took 5 putts. The software spits out much of the same data as the other systems, giving you a complete picture of your putting stroke. It confirmed the tendencies in our putting stroke we talked about earlier, going inside out. Using the data from those 5 putts, Nick explained what worked well with this putter and why. He also explained why aspects of a different style of putter wouldn’t work for us. 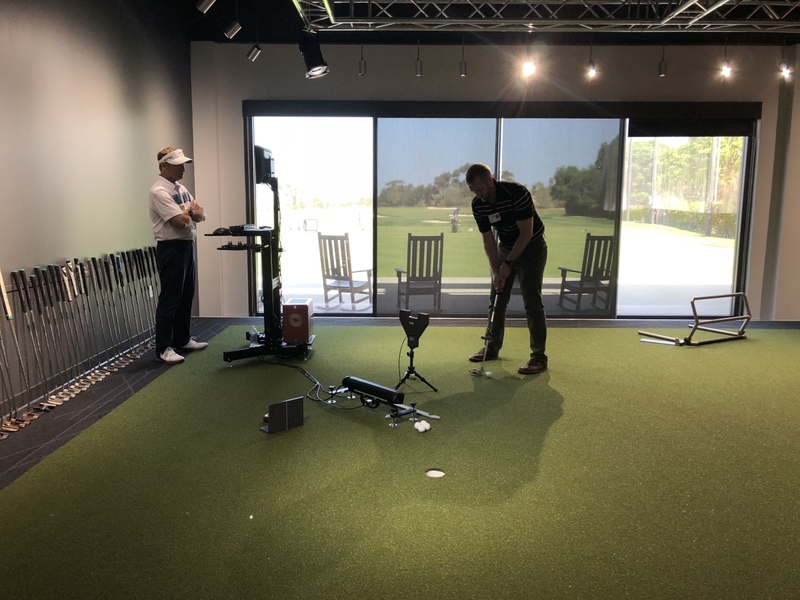 The effective loft, rise angle, and predicted launch angle info from SAM Puttlab informed Nick that our ideal putter needs a slightly lower loft to get the best roll on the ball. Length, lie angle, and grip were all covered from there, giving us a clear picture of the best setup. Going through a putter fitting is an eye-opening experience for many. Seeing what we thought we knew about our putting stroke versus the answers we got from the data was amazing. Without the help of a master fitter like Nick, it’d be easy to hit some putts in a store, like how the club feels, and put it into play. A proper putter fitting looks at the inner workings of the putter and why it works (or doesn’t) for your putting stroke. A big thanks to Nick and the rest of the Callaway team for hosting us and sharing their time and knowledge! It was much appreciated. 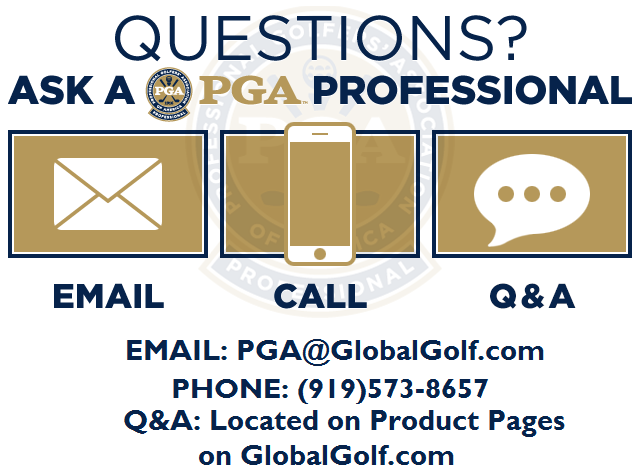 If you have questions about what putter would work for you, reach out to one of our PGA Professionals.